Discover what our favourite Sporting, Business and Media personalities love about our Great State. foundation21’s pictorial book ‘My South Australia 2’ gives you a personal insight into what our celebrity photographers enjoy about South Australia. Find out what Keith Conlon loves about Rapid Bay; David Campbell and Michael Klinger like about Norwood; where Bernie Vince and Graham Johncock grew up; where Jade Robran goes to unwind; where Georgina McGuinness goes on holidays; where Maggie Beer’s business began; and find out about Professor David David’s greyhounds. 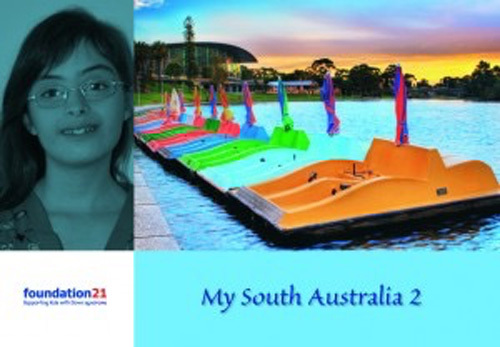 Featuring the photographs of 55 of South Australia’s best known personalities, ‘My South Australia 2’ makes a great business or personal gift. This book is an idea born with the catalyst being the love of this State, my passion for photography and my desire to help children with Down syndrome. The idea of publishing a book on South Australia, by South Australians is a doorway to achieving several outcomes. This project not only needed to generate revenue for foundation21 to carry out its objectives, but it also needed to raise awareness of both foundation21 and Down syndrome. With 55 South Australian identities agreeing to be a part of this publication, I believe that we have succeeded. Armed with a pocket Fuji Digital Camera, our celebrities went about photographing their favourite South Australian location and sharing with us their inspiration for their photographs. The selection of photographs are a testament to the commitment of our celebrities and the splendor and diversity of this State.